I hear from people at art festivals that they like a particular quilt but they believe it isn’t big enough for above their bed or above their sofa where they would like some art. I can easily make larger (wider) quilts, more suitable for above sofa and bed headboards BUT….and this is a big BUT…..people have very specific color needs and interior design schemes. So along with the wide range of sizes in sofas and beds, it seems quilts for these purposes are best made custom. For a queen size bed headboard wall quilt you would want art which is a minimum of 40″ wide up to a maximum of 45″wide. The rule of thumb for art size above a piece of furniture such as a bed or sofa is between 67-75% of the width, though all the guidance I’ve found also says to hang what you like with regard size but not to hang anything that extends beyond the width of the furniture it is above. Many people have a hard time ordering a custom quilt which is basically sight unseen, based on descriptions and expressed desires and a lot of trust in me, the quilt maker. I’ve come up with a way to use medium size quilts in spaces where a larger quilt would be better proportionally. I saw a picture of a medium size painting hung on a wall above a bed in a rectangle which was painted a different color than the wall, in other words, the painted rectangle appeared almost as matting or a large frame around the art. I thought this was a great idea but someone needed the ability to paint very straight lines which in all my years painting inside, even with the best tape in the world, I had yet to master. Instead I created a background quilt upon which the original art quilt hangs. This creates a three dimensional art quilt and uses a medium size quilt instead of a custom larger art quilt. It also gives you the option of using the smaller quilt elsewhere in your home or office AND of purchasing another art quilt from me to fit onto the background quilt so you can rotate your art. 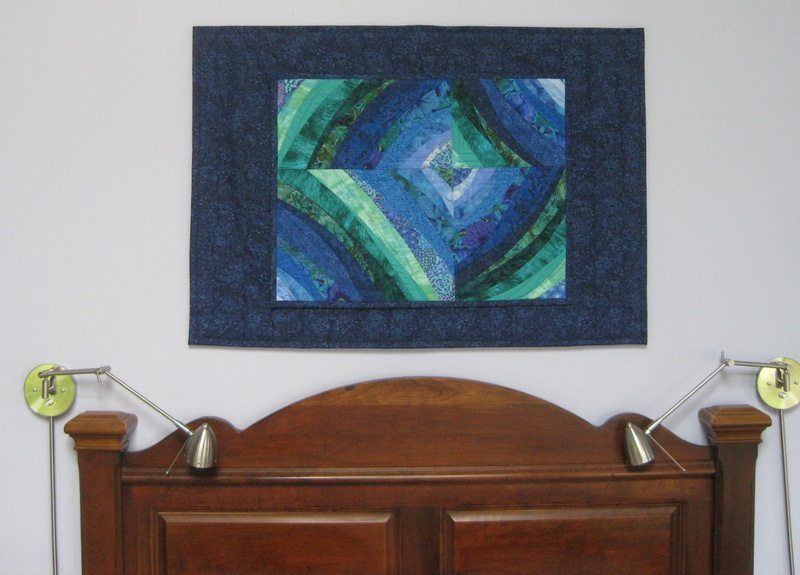 It provides flexibility and an alternative to purchasing one large art quilt. This design approach can work for above bed headboards and sofas along with above fireplace mantels. I would make the background quilts uniquely for which ever medium size quilt you selected in a color that coordinates with your interior colors and design. While my custom quilts cost between $50-$65/square foot, the background quilt costs $15-$20/square foot so this can be both a flexible interior design option and more cost effective, especially if you see a medium size quilt you would like to hang in a location where a larger art quilt would be more suitable. This picture is an existing art quilt which is 22″H x 29″W (Art Quilt Blue Green Curves) which is hung on top of a back ground quilt which is 30″H x 42″W. The headboard is for a queen size bed.